Unlike most of the Paleo Cookbooks out there, Well Fed is written by someone who has spent a lot of time in a commercial kitchen. Most of the Paleo Cookbooks on offer currently are written by homemakers or someone that has experimented quite a bit with their meals to adapt to a Paleo lifestyle. I am not saying the other cookbooks don't have good food, because they do, but this one gives you more of the basic building blocks to create a lot of combinations for meals. Consider it similar to Food Legos for the hidden chef in you. When I first picked up this book I was a little confused with it. I don't think it is so much the presentation as it expects a little more out of you in the kitchen instead of just handing you a list and directions. There are some recipes that hand-hold along the way but it is much more free-form and relies on you to spice things up a bit more. At the same time one recipe can be changed up quite easily with the addition of other spices or varied slightly and the instructions are there for doing so. I didn't really start utilizing this cookbook until I started the Whole 30 protocol. Melissa Joulwan (the author) helped design the menu plan in the back of It Starts With Food and I can tell. Some people might be put-off by this as there is no real hand holding but once you get a grasp on the potential, it liberates you a bit more while cooking, so you feel more confident in changing recipes as you see fit or experimenting a bit more with things. I've considered myself a decent cook in the past just because I don't burn things and I can follow instructions in recipe books. This book brought out some extra confidence in me by putting together some spice combinations that can be adapted for a number of meals. I will say that every single recipe that I have tried so far in Well Fed is awesome. The Carnitas are one of my favorites although it can quickly turn disastrous in the kitchen if you're not watching the meat. There is also a cocoa powder beef stew recipe with an orange gremolata that keeps you coming back for seconds even when the belly is loaded. During the Whole 30, I referenced the make-a-meal guide, where it outlines quick meals by having just some ground meat on hand and the addition of some simple spices and vegetables and you have a cheap and quick meal that can be pre-prepped on a Sunday afternoon. You can mix and match or add/delete things as it suits your tastes. The only thing that I am upset about is that it is too short. I know Melissa has a lot more recipes up her sleeve that maybe she is keeping close for now and working on something new. Compared to my other Paleo recipe books this one is short but the meals are outstanding. So, it may be small in volume but large in value. 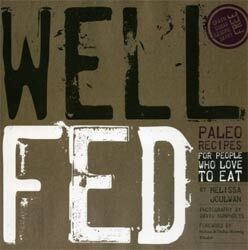 So glad you're enjoying the recipes in Well Fed and that it was helpful with your Whole30!